This Cuban cigar has a consistent construction and a generous smoke, resulting in easy and satisfying drawing. The aromas are strong when opening the box. Flavors tend to be woody with an evolution towards pepper and dark chocolate. 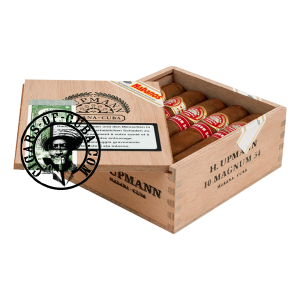 The blend is typical from the brand so if you are already a fan of H. Upmann, aging this one will reveal to be to your liking. This box of 10 will be perfect to age if you are not in a hurry to try it!